Rob Cesternino and Akiva Wienerkur aren’t opening a make-your-own-pizza place, but they did bring you the latest episode in their run through the entire Seinfeld series. 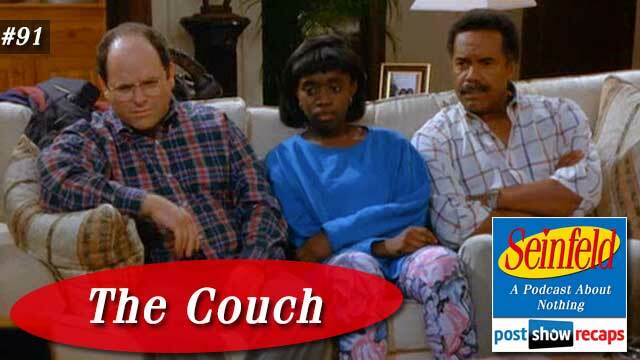 This week, they recapped “The Couch” which first aired October 2, 1994 as part of season six. The episode was written by the Larry David. There was some news in the Seinfeld universe this week. First, Larry David just had his appearance on Saturday Night Live. Akiva shared a story about a writer who wrote about how Jerry said his name wrong a few times in an interview, then called later to apologize. Also, there was a favorable ITunes review that Akiva had to translate because it was written in Hebrew. The story for Jerry is he is excited for his new love seat he bought. When Kramer tells Jerry about going to business with Poppie, and how his restaurant has this fantastic duck dish, he decides to try it out, despite the hand washing issues he had the last time. While at the restaurant, he decides to cause some trouble by asking Poppie his opinion on abortion, enraging Elaine and other diners to the point of walking out when he says he’s against it. Later on, Kramer brings Poppie by Jerry’s so he can pay Poppie for the special order duck. While waiting for Jerry, Poppie pees on Jerry’s new couch, ruining it. George’s girlfriend convinced him to join a book club, getting assigned to read Breakfast at Tiffany’s by Truman Capote. While he’s enthusiastic, he just can’t get into the book, watching TV and reading Cracked Magazine instead. When his time starts running out, Jerry recommends George just rent the movie. The video store doesn’t have a copy, so George gets the address of who rented it by sneaking a look at the computer at the front desk. He shows up at the people’s apartment, and they reluctantly let George watch along with them. Not long into the movie, George gets aggravated by the woman talking during the movie and the daughter taking his seat, which causes him to spill his grape juice all over the couch, getting thrown out before seeing the end. Elaine is immediately smitten when she meets one of the movers bringing Jerry his new couch, and later on has a great date with him when he brings Jerry’s old couch over to her apartment. While at dinner with Jerry, she learns that Poppie is anti-abortion, so she walks out before eating, prompting Jerry to question what she would do if her new mover boyfriend felt the same. When she learns that he is anti-abortion as well, they inevitably break up. Kramer is partnering up with Poppie on his idea for a make-your-own-pizza restaurant. Despite Elaine and Jerry ruining a night of Poppie’s business with the abortion talk, Kramer and Poppie are still partners for the new venture. The relationship does sour however when Kramer and Poppie argue over what a customer can put on their pizza. There were some great tangents by Rob and Akiva this week. First, they found it unbelievable that the couch movers would just drive all over town to deliver other things not on their schedule. They also talked about how strange it was that Jerry didn’t remember Poppie at first, and how Poppie’s has become quite the fancy place. Next, they debated when the “hot take” era began, with Akiva thinking it was concurrent with the start of Twitter, while Rob thought it was when Tim Tebow was the quarterback of the Broncos. Rob also thought it possible that the writers might have had to change Poppie to peeing on the couch from going number two. He came up with his theory based on the chili gift Poppie was given by Elaine and Jerry. In 2016, George would have zero difficulty getting to watch Breakfast at Tiffany’s, but that was really all that would need to change from 1994. The guys thought that Jerry’s storyline was great and deserved an A. They also thought George had a strong showing, giving him an A as well. Akiva was not big on Kramer’s storyline, settling on a C after Rob questioned him giving a D. Lastly, he gave Elaine a B+, but Rob thought Elaine deserved lower. Akiva enjoyed this episode, but it wasn’t an all-timer, so he ranked it at 74. The email bag was pretty full this week. First, Jim asked why the daughter would sit next to George, a complete stranger, when watching the movie. The guys agreed, noting that 1994 was before the “to catch a predator” world. Harry wrote in to share that there are now some make-your-own pizza places, but Akiva thought the business idea never really took off. Liz asked if Jerry would be upset if it was a baby who peed on the couch. Akiva thought with it being Jerry the neat freak, he’d have a problem with any urine. Craig noted that cucumbers on pizza seems a bit too weird. Rob and Akiva talked about French fries and tuna fish being the weirdest they’ve heard of on pizza. Johnny De Silveira wondered why the mover didn’t have a proper car, but rather the moving truck on the date with Elaine. Rob asked if maybe he lived in the truck. Amir asked why Poppie wouldn’t be more cognizant of hygiene after hearing the story about his mother dying from bad fish. He also noted that Poppie is the most terrible person to appear on the show. Finally Chester pointed out that Elaine was excited for the duck, though she is a vegetarian. He also thought the episode could have been a great one, but the ending ruined it’s chances. Lastly, he shared how George’s girlfriend is also the actor who played Susan on Friends. Tune in next week as the guys will recap “The Gymnast” where the guys will get to talk about George eating out of the garbage. Send in your questions by emailing [email protected] Don’t forget to subscribe to the podcast by going to postshowrecaps.com/seinfeldITunes where you can rate and review the podcast. 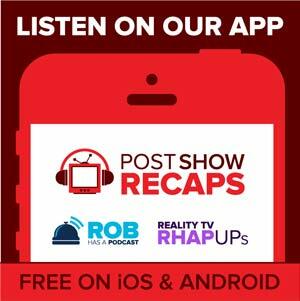 You can get a discussion going about the podcast by leaving a comment on the show page, and as always, you can follow them on Twitter @robcesternino and @keev26.